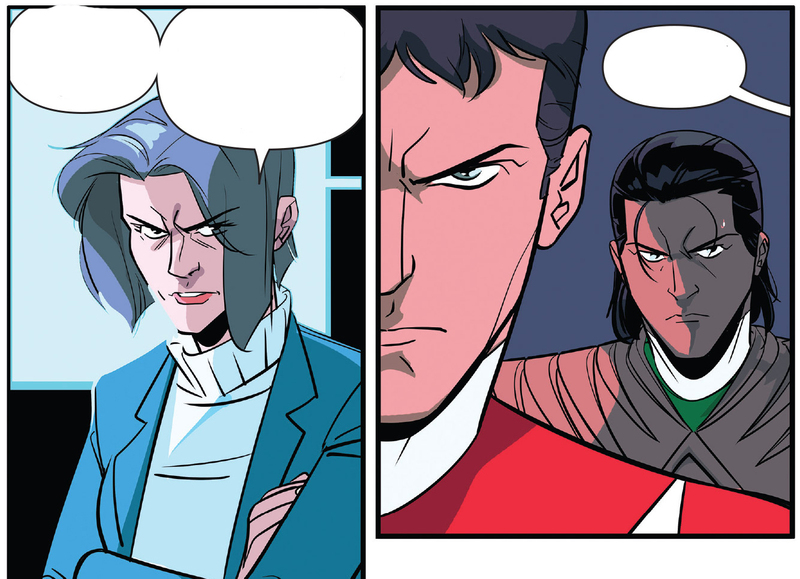 The issue starts off in the future with Power Rangers Time Force. 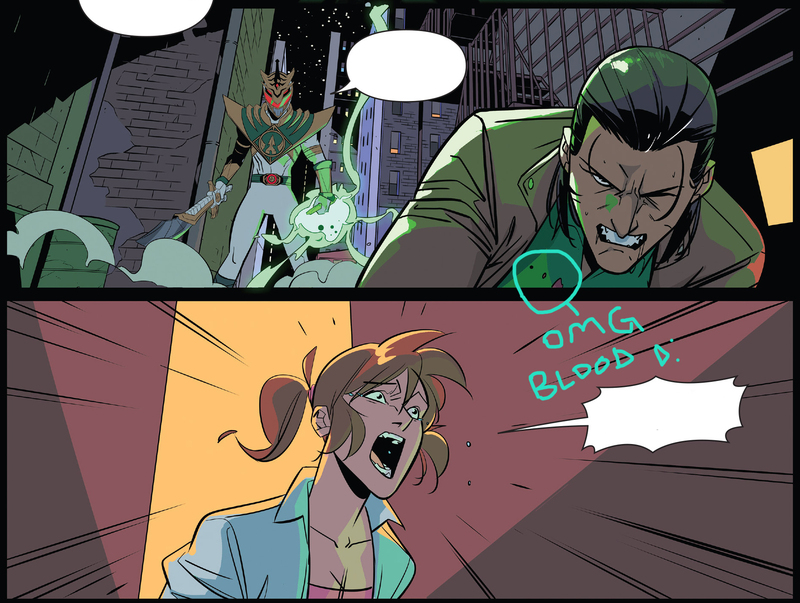 Our favorite heroes from the future are investigating a massive fracture which is ripping through time and space. A quick scan of other dimensions shows that this is not isolated to their current position – it’s happening everywhere. Jen is able to pinpoint the nexus point – whatever happened it happened in the past. 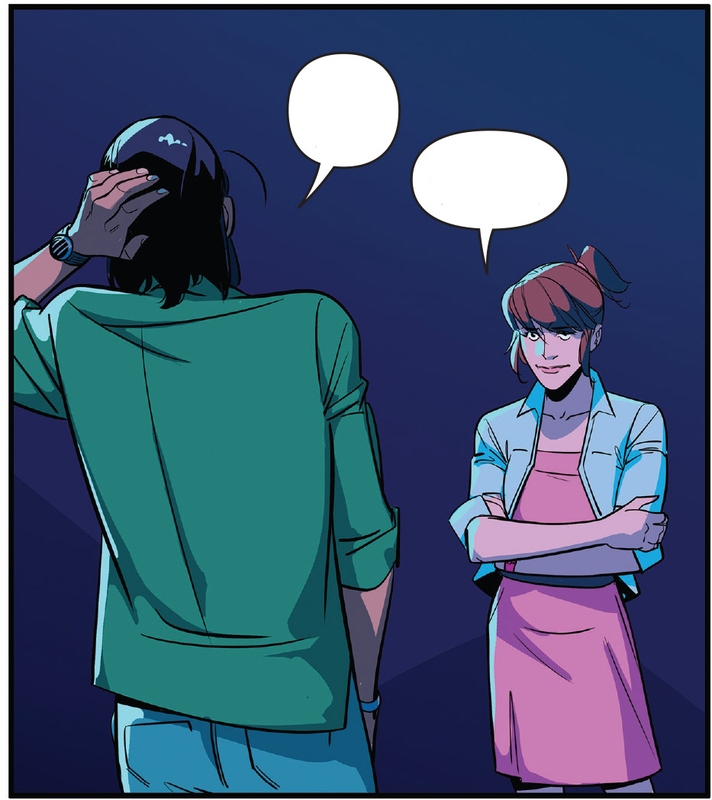 Wes tells her she needs to go to the nexus point and stop whatever happened from happening. The Blue, Yellow, and Green Power Rangers Time Force are sucked out of the Megazord and swallowed up in to the fracture. Wes says he will pilot the Megazord and give her enough time to make the jump. As Jen prepares to make the jump, the Megazord breaks apart and explodes as a giant Lord Drakkon figure appears in the fracture, reaching for her. But before he can grab her – she disappears through time. We cut back to the Command Center as the Power Rangers, along with Grace Sterling, review the security footage from Promethea. They watch as Lord Drakkon breaks free, snaps Saba in half, and disappears through a portal. Grace offers to help and Jason refuses her, letting her know she’s done enough by keeping secrets. She tells him that Lord Drakkon took his disabled Power Morpher with him when he left, meaning he may be looking to restore his powers. A civilian form Lord Drakkon is going through the trials with Ninjor, who is impressed that someone was able to complete the trials so quickly. Lord Drakkon tells Ninjor that in the future they are friends and that Ninjor’s abilities were crucial in creating his powers and his trusted saber Saba and that he needs him to restore his powers. Back at the Command Center, the Power Rangers discuss what their plans are going forward. They have no idea where, or when, Lord Drakkon is, and decide that until something comes up they need to keep themselves busy. Trini and Billy decide to add a secondary shield to the Command Center specifically focused on Lord Drakkon’s powers – this way he won’t be able to sneak attack them. Alpha 5 goes about decoding what Lord Drakkon said in the security footage to figure out exactly where Lord Drakkon teleported to. Tommy and Kimberly, having an awkward moment regarding their relationship, agree to go see a movie to pass the time. Ninjor is hard at work putting together Lord Drakkon’s powers. He mentions that he must have made them in a rush in Drakkon’s world as they appear forcefully fused together, but this time he will make sure they are perfectly intertwined together, making them more powerful. Lord Drakkon, meanwhile, observes Ninjor’s library and asks about the books and the authors who wrote them, leading to a brief conversation about the Masters of the Morphin Grid – or as fans may remember them as, the Morphing Masters. Ninjor says it’s a tale for another time, and Lord Drakkon receives his fixed Power Coin. He morphs shouting “Black Dragon!”, and Lord Drakkon is back. He immediately exclaims he feels weaker but Ninjor assures him it is only temporary. As Ninjor tells Drakkon to rest, Lord Drakkon states Ninjor is a fool but he isn’t done with him yet. Billy and Trini are hard at work developing a secondary shield for the Command Center. Trini insists on taking a break and, unbeknownst to them, Lord Drakkon emerges from the shadows and takes the fragment crystal that stores Green Chaos Energy. A wicked smile crosses his face. …only to be stabbed through the chest by Lord Drakkon! Lord Drakkon holds the crystal, now super-charged with Green Chaos Energy, and chastises Tommy on how he was right about his friends not being there for him. Kimberly rushes in to the alleyway and morphs – leaping in to the air to fight Lord Drakkon. He, however, rushes her, ready to strike with Saba. 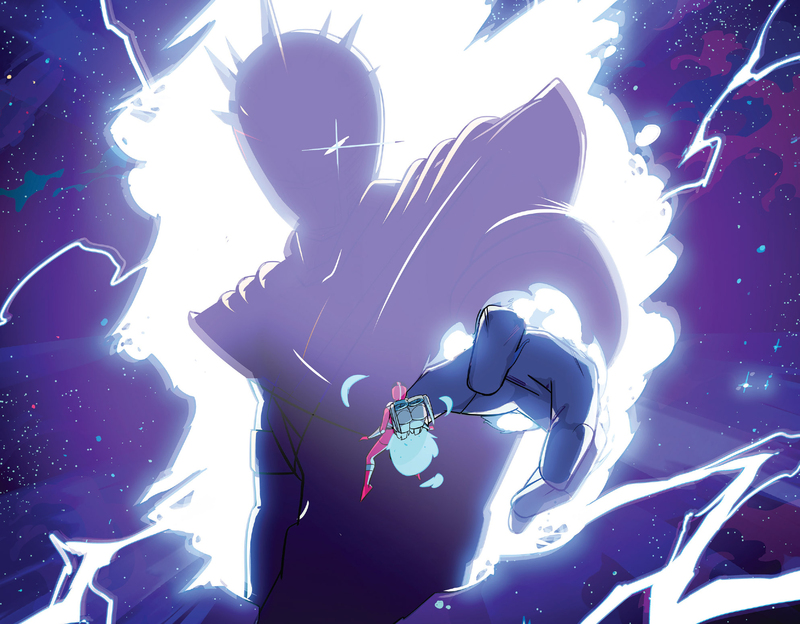 But before he can reach her a giant pink energy ball appears, pushing him back. Jen, the Time Force Pink Ranger, appears and blasts Lord Drakkon at point blank range, sending him flying across the alleyway. As Kimberly tries to identify her, Jen tells her there’s no time and to just shoot. The two Pink Rangers unload their arsenal on Lord Drakkon who says “Home”, opening a portal that he disappears through. Jen informs Kimberly that Lord Drakkon has returned to his homeworld as Kimberly demorphs and rushes to Tommy’s aide. He lays on the ground, dying, trying to speak to Kimberly. As Tommy stops breathing and his pulse fades, she begs Jen to help her, but Jen exclaims that it’s too late, and that Tommy is gone. She calls for help on her communicator and holds Tommy close to her. And Tommy Oliver, the Mighty Morphin Green Ranger, dies on the street. Holy crap! 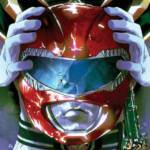 Kyle Higgins convinced Saban Brands to let him kill off their face of the franchise! Nearly everyone assumes that there’s going to be some Power Rangers death during the Shattered Grid, but we figured it would be from Power Rangers no one really cares about – like Kevin, the Samurai Blue Ranger, or Power Rangers Operation Overdrive (yes, the whole team). To kill off the main character of the story is a bold move but it also shows that this story-arch isn’t going to pull its punches. Daniele Di Nicuolo does a fantastic job with the art, faithfully capturing the emotion of each scene. Slightly disappointed that Tommy’s murder-scene was censored a bit (the sword doesn’t go through his chest, nor does he ever bleed), but we can confirm that Tommy Oliver, at least for now, is dead. The colors from Walter Baiamonte are also very well done, causing each page to pop out and really sets the mood. The overall pink overlay during the final scenes really helps make the fact that it’s two Pink Rangers fighting Lord Drakkon stand out in a cool way. 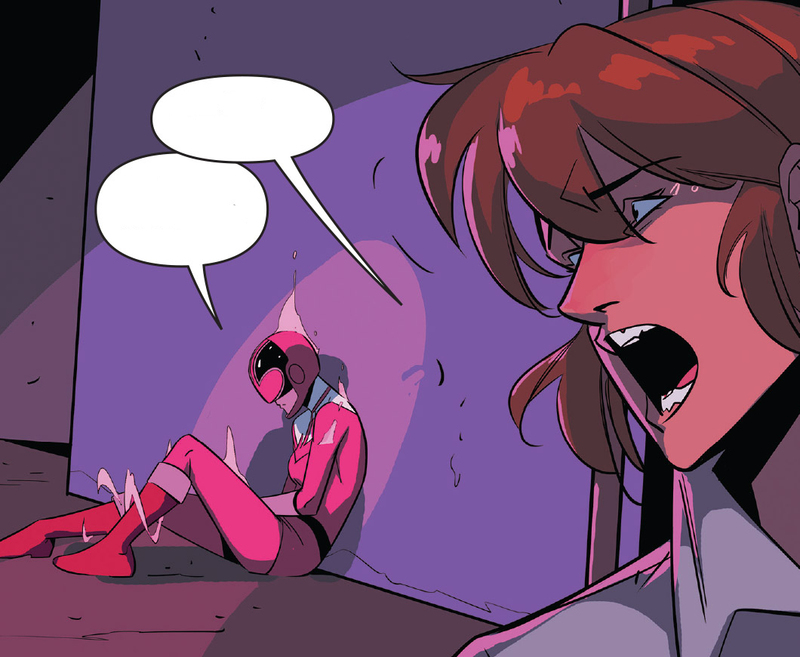 One of those “oh hey, that’s cool, two Pink Rangers and the whole scene is washed in pink light” moments. So where does Power Rangers go from here? It’s hard to say! We’ve seen covers from other issues, but we assume that if Tommy dying is the focal point for the fracture happening all over the multiverse then the goal is going to be to get Tommy back before Lord Drakkon can kill him, and then to stop Lord Drakkon once and for all. We do believe that by the time the story ends, Tommy will be amongst the living once more. But which Tommy, and from what time? And how does this effect the other timelines where Tommy is part of the team – like Power Rangers Zeo, Power Rangers Turbo, and Power Rangers Dino Thunder? There’s so many questions and we wish, more than anything, that we could be a fly on the wall in Kyle Higgins’ office. This is a brilliant issue and one that any fan of Power Rangers needs to buy. While it doesn’t have the same “oomph” that say the Death of Superman had, for this franchise it’s their own Death of Superman moment. It just came at the beginning of the story instead of the end – but that will undoubtedly lead to some great story moments going forward. Mighty Morphin Power Rangers 25 is available now in comic book stores across the United States, as well as your favorite online outlets. Special thanks to BOOM! Studios for the advanced copy of the book. On Wednesday, March 28th 2018, TokuNation.com will spend the entire day celebrating BOOM! Studios' Power Rangers comic books Mighty Morphin Power Rangers and Go Go Power Rangers. We'll be releasing various articles celebrating the stories, moments, covers, and characters that have shaped the last two years in Power Rangers. The day will cap off with a spoiler-filled review of Mighty Morphin Power Rangers Issue 25 which consists of the biggest event and twist to ever happen in Power Rangers - EVER! After a full day of celebration we invite you to share with us your reactions to Mighty Morphin Power Rangers Issue 25 here and on social media. 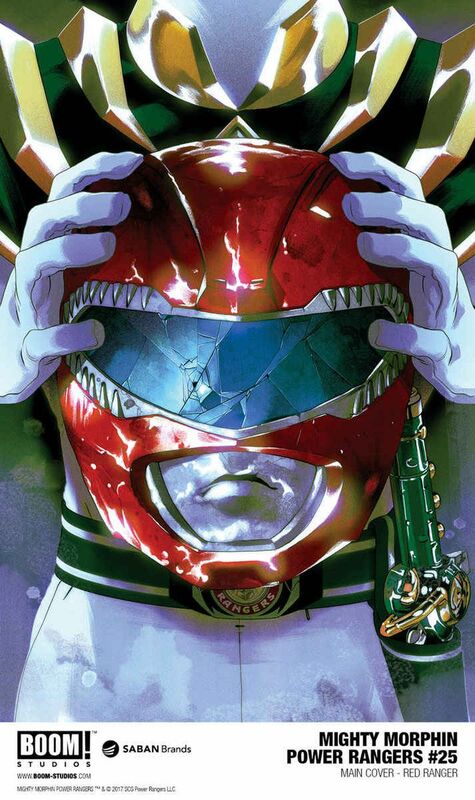 Please use the hashtag #ShatteredGrid and #PowerRangers on social media when sharing your thoughts and opinions. Be mindful of those who haven't read the book yet while on the forums and use the SPOILER tag. We can't wait to see, read, and hear your reactions! Wait.....the comic isn't out yet?! I thought it came out this past Friday? Finally, a chance to settle the score with my other universe self. That jerk scared my dog and stole my plate of tamales. Added an image for our day of celeberation of BOOM! Studios Power Rangers comics. Dammit, I only have a day to learn the dark arts to possess an AU version of me! A- The Rangers could use the help. B- The League does have experience with this sort of thing. Any word on how many issues this will be?